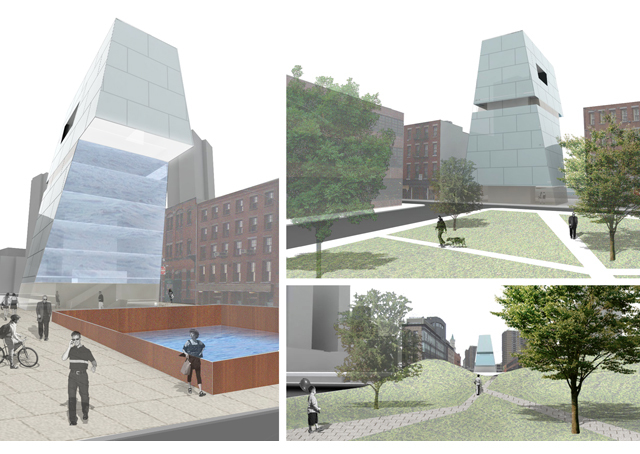 This project was an entry to the 2008 ENYA Competition: South Street Seaport Re-Envisioning the Urban Edge. 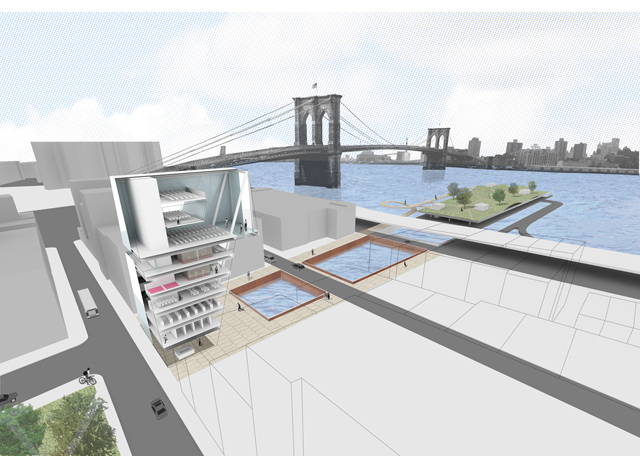 The competition brief called for the design of a new pier on the East River containing a mixture of community facilities. 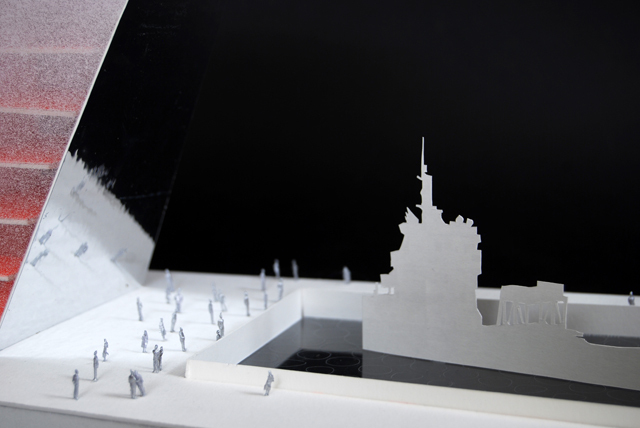 The authors of the competition hoped that such a structure would help to reconnect the community to their waterfront. 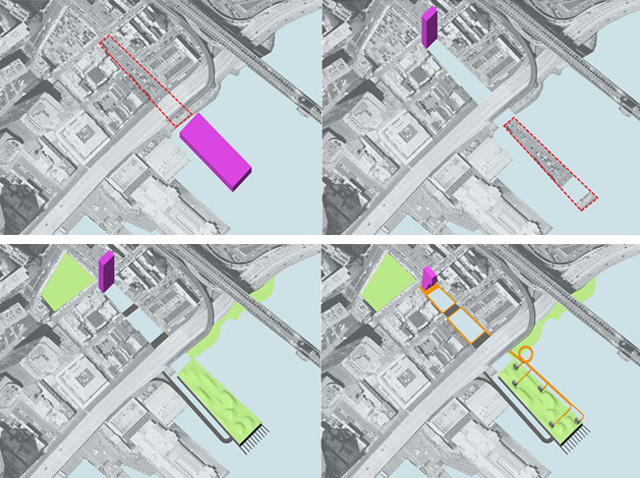 This entry contends that the best way to reconnect the South Street Seaport neighborhood to its waterfront is not to isolate community facilities on a pier on the East River. By drawing the coast line deep into the city fabric, this project creates an urban space for the community that is centered around the waterfront, restoring Peck Slip’s historic relationship to the water’s edge. 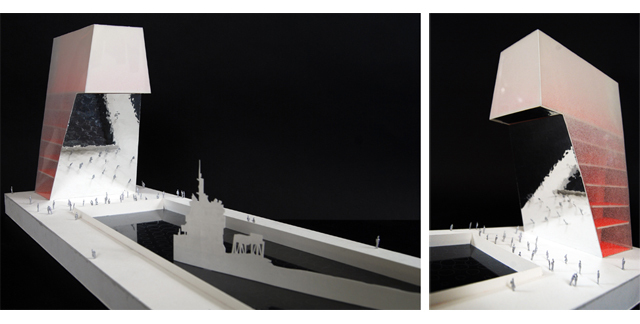 The pier of facilities called for in the competition brief has been rotated 90-degrees to create a vertical pier with frontage on Water Street. This vertical pier reinforces the street wall on Water Street, and defines Peck Slip as an open-ended urban space that embraces its waterfront to the East. Carefully considering the scale of the building at the pedestrian level, the structure has been shaped to minimize its footprint at the base, where public programs are easily accessible to the community. Above, the building is allowed to rise beyond the level of the surrounding context to create an iconic beacon for the neighborhood. The sanctuaries are located on the soaring upper levels of the building, providing dramatic views of the East River, Lower Manhattan, and the Brooklyn Bridge. The parking that once crowded Peck Slip has been moved out onto a Pier on the East River, where it has been covered with a landscape that frames views back into Peck Slip. The park/parking pier integrates vehicular and pedestrian traffic, and links to the park space that is being developed along the East River. The project is both conservative and progressive; practical and dreamy. It respects the history and site conditions of the neighborhood, while stridently defining a new center for the South Street Seaport neighborhood. The parking in Peck Slip is moved out onto a “parking pier,” reintroducing the water to Peck Slip. The parking pier is topped with a public space that extends the new East River waterfront park network. 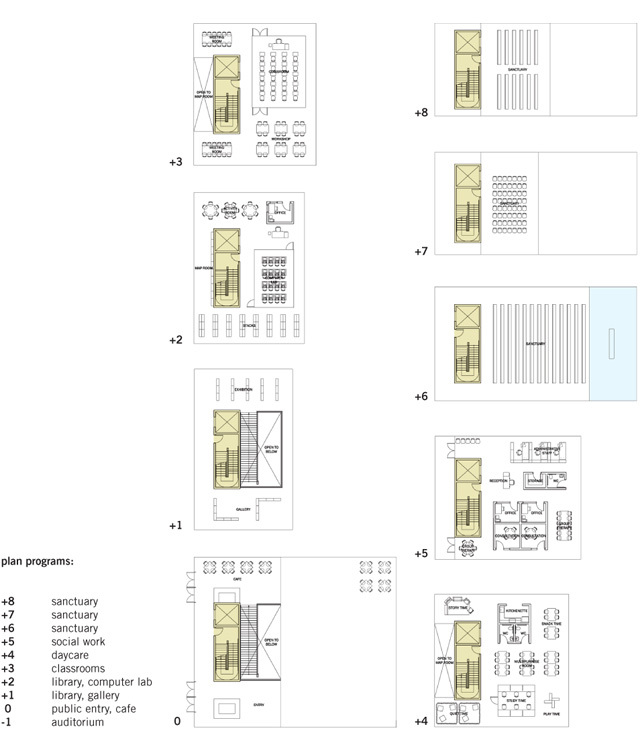 The pier of public program that the competition brief requested is turned vertical, becoming a mini-tower that defines the western side of a new Peck Slip water plaza. The structure’s belly is clad with mirrored glass and slanted to reflect the activities in the plaza below. The building becomes an immense screen and illusively extends the space of the plaza.